Wondering the “MOBILE NETWORK NOT AVAILABLE” error message pop-up in your android device? Then here I will show the possible solutions to fix it. Mostly this type of error has to get on your Samsung devices. If you have to get “MOBILE NETWORK NOT AVAILABLE” error on your Android device these means your cellular network problem. And also I received similar questions by some users to where their phone loses network connectivity simply without any reason when they are in the house. So you need to follow the simple solution steps or solve your problems like sim card sensor, incorrect configuration or a faulty sim card. Step 2: Tap on Mobile networks. Step 3: Data Roaming (If Your Phone Is Roaming then turn off). Step 1: Power off your Android phone and remove both battery and SIM card. Step 2: After wait for 5 minutes and then insert the battery and the SIM. Step 3: Now power on your phone and check it. If still receive the Mobile Network Not Available Error, then follow solution 2. Step 1: Go to settings and open Wireless and Network settings. Step 2: Now tap the Mobile Networks. Step 3: Tap Network operators and Select automatically. That’s it. There is a problem with the radio signal not being broadcasted correctly. Now you can see the Software update option and tap on it. Also, check your software is up to date or not. If not, then update it. Most of the people have faced this problem. Now Tap on Mobile network settings. While you are in mobile settings, you have to hold the power button and the home buttons together until your device turns off. While your Galaxy is off, gently remove the battery. Now Press the home button and the power button 10 times together. Then, Press and hold the power and home button for 1-2 mins this will drain all static charges. Boot up your Samsung Galaxy with the SIM Card. Do not attach the back cover yet. While your phone is on, remove then insert the SIM card 3 times. You will be prompted to restart your phone. Restart your phone and you will no longer see the error while searching for network. If none of the above solutions worked for you then you just got one way to solve the issue. 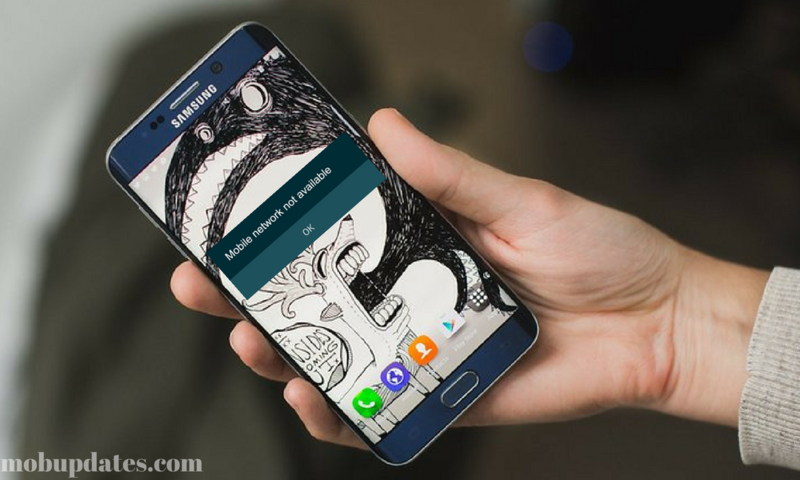 Factory Reset your device should fix your issue. The factory reset process will delete you all data. If you are ready then go to Settings → Reset→ Factory data reset→ “Reset Phone” or you can also power off your device → Press down Home + Power + Volume Up buttons for a while → use volume keys to navigate to “wipe data/factory reset” → confirm via the “Power” button. So, these are some of the Solutions to Fix “MOBILE NETWORK NOT AVAILABLE” Error in Android. I hope you like this post and your problem is solved. If you have any trouble, you can share us in the comments. Next articleFallout Patch: What’s New Fallout 4 Update?